"My goal is to partially cover the regional needs for organic foods"
Sprouts and herbs are among the fastest growing product segments in the fresh food sector. Even in the Austrian specialist trade, sprouts are becoming increasingly important. Recently, the region of Tyrol welcomed a new producer: Martin Appler. And the innovative grower from Thaur has already won over a few regional customers. The dedicated grower has only been active in production since last December. For now, he specializes exclusively in the cultivation of garden and rocket cress, both of which are produced organically. The rocket cress is in the foreground, from a purely quantitative point of view, explains Appler. "Although generally there is a reasonable demand for garden cress, I am one of the few providers in the field of organic rocket cress in the larger region. That's a big advantage." About a year ago, Mr. Appler started his first experiments in greenhouse cultivation of different varieties of organic herbs. At the end of that year, one of his larger customers retired, and his successor began to market a large and possibly regional organic range. Since then, everything went relatively quickly, because now the first produce was already expected in December, not the next spring. "Construction of the site -including the heating- was not finished yet and I needed to get organic certification in a very short time." Despite the unexpected events, the innovative producer managed to build a modern production hall with integrated floor construction within a very short time. The cress is produced on so-called trolleys, which can be loaded flexibly as needed. "Because of a lack of daylight, we now tend to produce on 4 levels in winter. In summer everything can be a little bit closer to each other and we'll probably go back to 5 levels. Furthermore, during the winter we have to be careful that during loading from the production hall to the cold storage, the temperature differences do not get too big. In the summer, however, this problem is even greater - especially when it there will be a prolonged drought again, like last year." The organic herbs are usually harvested continuously, says Appler. They are primarily offered to regional customers, from wholesalers to farm shops and specialized retail stores. "In general, the majority of products currently come from abroad. My main goal is to partially cover this regional need for organic foods. So if it works, we'll be able to add more varieties in the future, such as radish cress and red cabbage cress." With regional wholesaler Giner, Appler has already found a significant buyer. The feedback after the first marketed batches, last week, was positive at this time. 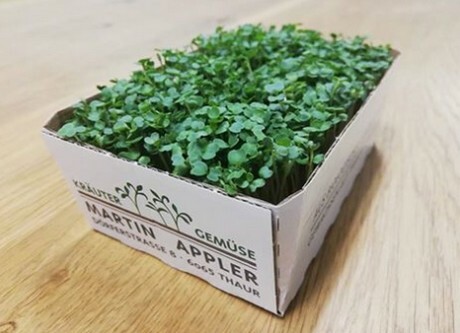 "We primarily serve restaurateurs and in this area these regional cress varieties are already in demand. We are already in the process of advertising the two cresses on Facebook and we see an interesting potential for these products," reports the sales department.